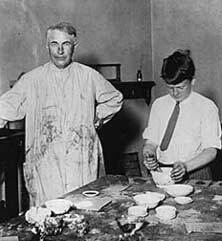 Edison and son Charles in the lab. Courtesy: Smithsonian Institution. Like many contemporaries, Thomas Edison was the patriarch of a large family. Between his two wives, Mary and Mina, he fathered six children, a typical family size for the late nineteenth and early twentieth centuries. Edison was a famous and wealthy man and being his child was often a difficult experience. Edison’s long hours in the lab meant a lot of time spent away from the family. Besides, growing up in the great man’s shadow put pressure on the children to equal their father’s accomplishments. Edison’s first child was a daughter, Marion, born in 1872. Edison affectionately called her “Dot,” a reference to Morse Code. Her younger brother, Thomas, Jr., was called “Dash.” Edison and Mary's third child, William, was born in 1878. Mary Edison died in 1884, and Edison married 20-year old Mina Miller two years later. This marriage was difficult for some of Edison’s children to accept. Mina was closer in age to Marion then her husband and she had an uneasy and difficult relationship with her step-daughter. Marion felt displaced in the family by Edison’s young wife. The tension between Mina and Marion created a rift between Marion and her father. Marion often felt neglected by her father. As a teenager she spent a lot of time in Europe and at one point developed smallpox, a serious. Throughout the seven week duration of the illness, she received only two letters from her father. This type of indifference hurt Marion very much. 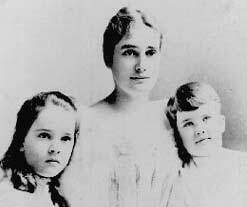 Mina became a stepmother to Edison’s three children, and she and the famous inventor had three children of her own: Madeleine (1888), Charles (1890), and Theodore (1898). Like all of Edison’s children, they were subject to high expectations, both from their father and society in general. Edison would have liked to see some of them follow in his footsteps as an inventor, and although some did try, they generally met with modest success. William briefly studied science at Yale University, and later served in World War I. He was involved in several businesses, including an automobile repair shop in Washington, D.C., where he also invented new designs for spark plugs. Unfortunately, William did not get along with his father, who said he had “brought the blush of shame” to his cheek many times. William later became a chicken farmer in New Jersey. It has been said that the Edison child with the greatest aptitude for science and engineering was Madeleine. She was said to be quite sharp witted, and some have speculated that she might have followed in her father’s footsteps if women had been freer to pursue careers in science and engineering. Madeleine unsuccessfully ran for the U.S. Congress in 1938, and in the 1950s sat on the Board of Directors for the Western Union Company. Of all the Edison children, Charles was the best known to the general public. In 1927, he took over the presidency of his father’s corporate organization, Thomas A. Edison Incorporated, and ran it until it was sold in 1959. Charles also entered public service. In 1940, he briefly served as Secretary of the Navy under President Franklin D. Roosevelt. During his time as Secretary of the Navy, he decided to try a career in politics, and served as governor of New Jersey from 1941 to 1944. The one who followed most closely in Edison’s footsteps was his youngest son Theodore. He graduated from MIT in 1923 with a degree in physics. He worked as a laboratory assistant for Thomas A. Edison, Inc., and worked his way up to director of research and engineering. Later, he founded a company called Calibron Industries near the West Orange plant and began inventing on his own. He held 80 U.S patents by the time he died in 1992. This page was last edited on 2 October 2018, at 23:14.